After all these years, I finally got my HDTV | Tales From The Ipe! After all these years, I finally got my HDTV. Oddly enough, it hasn’t truly hit me yet. You would think that I would be dancing around, giddy like a little schoolgirl. It would be within the realm of possibility that I would do that, and justifiably so. I’ve absolutely salivated over the thought. Instead, I’ve been pretty chill about the entire purchase. I think it’s partly because I haven’t truly had an opportunity to enjoy it very much. I should explain. We’ve had a busy few days, so my mind has been elsewhere. For the past week, I’ve been working in Delaware and staying at my sister’s house. Work has been generally pretty busy. On July 4th itself, we’re hosting a large BBQ summer party at our little abode, so we’re in preparation for that. We’re in the midst of decluttering, and have been tossing out all the old stuff, and organizing the house a little bit better. With all that going on, who has free time to sit on the couch and vegetate? Not us. I think televisions are fine, but my life stopped revolving around it years ago. What I do think is that when I DO get to sit in front of it, I like it. I watched Star Wars: A New Hope Sunday morning with Josh & Lily. It was something else to see all the visual detail that I’d never noticed before. I also watched a bit of the USA vs. Ghana World Cup game, and that was picture perfect bummer of a result. I played a little Uncharted 2, and the game went from nice vista to panoramic beauty. 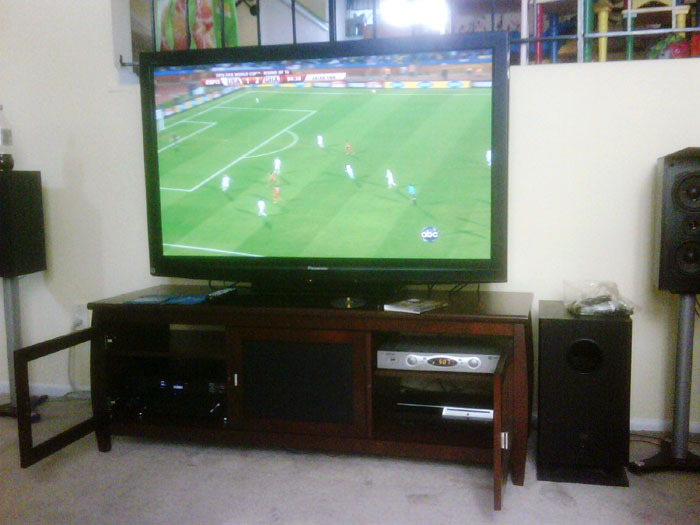 On Friday morning, I woke up at 4:30am, and began to put the tv stand together. The AV receiver has been sitting here since last Saturday, and I was expecting to move the old Sony tv and stand to someone’s house. The tv was scheduled to come Saturday, and I wanted a headstart to get the new stand up, and the packaging bagged and thrown out. It took me about four hours to put the stand together. On a tangent, if I could go back in time, I’d invent the Allen wrench. It’s as if the entire slate of Chinese-manufactured products are required to be built with Allen wrenches. I can not tell you how many months of my life so far have been spent putting together some piece of furniture with an Allen wrench. And dowels. And those annoying bolts that you have to stick into one of those round things in a hole, and twist and lock that bolt in. You know what I’m talking about. Anyway, occasionally, I used a Philips screwdriver as needed, but towards the end, I did have to switch to my Black & Decker cordless screwdriver, which was a big help. I finished assembling the stand around 9am, which was good, because I had to switch over to doing work. Good timing, eh? I think I’m getting better at putting furniture together after all these years. In the evening, one of Namita’s friends came over to pick up our old 32″ Sony Wega tv and stand. We put that heavy tv in my Highlander, and loaded the stand in her car. Josh wanted to come along, so I belted him in, and we then drove to Princeton to move it all into her apartment. It was heavy, but she was pretty happy. And it was free, since we couldn’t find a buyer. In 2010, everybody wants an HDTV, not a clunky, heavy, SDTV. On the way back, we picked up some Papa John’s and wings for dinner at home for the whole family. On Saturday afternoon, I moved the old AV rack, and old Onkyo receiver and 6-disc DVD players into storage in our basement. I moved the stand into place, and put all our current devices into their respective spaces. The tv delivery guys from Ceva arrived in the late afternoon, unboxed the tv, assembled the stand, and turned it on for me to verify all was in order. Below is a picture of the new setup, until we re-arrange the rest of the living room. I have mixed feelings about no longer using the old Onkyo DVD player and receiver as they’ve served us well since I purchasing in Nov 2003. Unfortunately, the only reason driving my decision is that neither was compatible with HD. I’m happy that my PS3 plays Blu-rays and upscales DVDs well. For now, I don’t need another Blu-ray player, and that means one less device that I have to buy. We were busy the rest of the weekend with kid birthday parties and more shopping, but I was a little frustrated with getting the new Pioneer receiver working properly. I did the automatic setup (with the included microphone), but I could tell that the 5.1 surround features weren’t working. It kept defaulting to Stereo, and I couldn’t get the subwoofer to go from Standby to On. It should turn on if the receiver tells it to. Late Sunday night, I read most of the thick VSX-1020-K manual, and played with the HDMI connections via trial-and-error. Eureka! The subwoofer’s little light changed from Standby red to Green On, and I could hear a little bass now. I’ve also noticed a slight buzz with this G25. If you stick your head behind it or have the surround sound on low, I can hear the slightly perceptible buzz. It’s probably not a dealbreaker, but I thought I should notice it. It’s very reminiscent of a flourescent bulb. I’m wondering if it’s just because I’m in the break-in period on the set? I’ll wait out the two weeks, adjust the display settings (color, brightness, etc.) and review the results. Finally, just to note, I’m currently kicking myself for miscounting the number of HDMI and digital optical cables I needed. I had ordered them last week through Amazon for outstanding prices at less than $7 each, but found out that I needed one more of each. I considered running out to Best Buy, but the brick-and-mortar big-box retailers charge 4x the amount. I decided to order from Amazon again, and just wait until Tuesday. In the meantime, if we want to watch movies / play games , or watch television, I have to switch the cables to different inputs. By Tuesday, this should all be better. We renewed our Amazon Prime membership again this year, and I’m very pleased. When this type of situation like the need for additional occurs, it’s not too bad. I can order more stuff, and am not penalized by additional shipping fees. It’s all paid for, and it gets here in just two days. It’s a win-win-win situation. This entry was posted in Personal and tagged amazon, hdtv, home improvement, onkyo, panasonic, sony. Bookmark the permalink.